You have been invited into the world of the legendary Jungle King. Click here to play! The great man himself has a task for you: to spin up the greatest winning combinations possible! Succeed in this task and you shall be greatly rewarded. 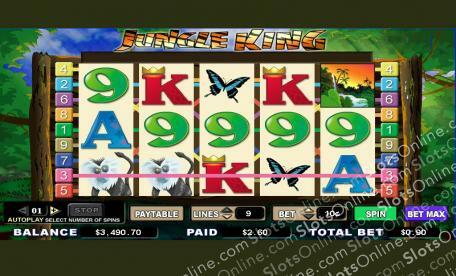 Jungle King is a wonderful 5-reel slot that is played across 9 unique pay lines, with more activated lines meaning more winning combos for you. The Big Chief is Wild and can become any other symbol on the reels except Scatters. When used in a combo, the Big Chief payouts are doubled, and the Bonus Round is activated when he shows up on reels one and five. Jungles are Scattered, pay out up to 200 coins, and can appear anywhere on the reels. This task has been set before you and you alone. Will you take up the challenge and earn the riches of the Jungle King? Jungles are Scattered and can show up anywhere in order to earn a payout. Land two or more each spin to win cash of up to 200 times your wager. The Big Chief is Wild and can be subbed into winning combinations. All prizes are doubled when the Chief completes combos, so use him as much as you can. When the Big Chief lands on reels one and five on an active pay line, the exciting Bonus Round will be triggered, when you must play your way to riches.